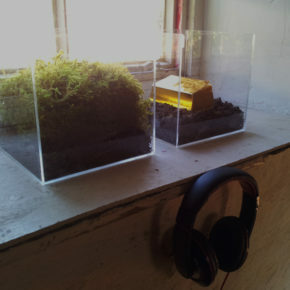 The project “One kg of investment in knowledge ”, is inspired by the three words composing the Rhod theme (the residence program that host the eight step of Journey into Fragility) : Future - Nature - Culture. 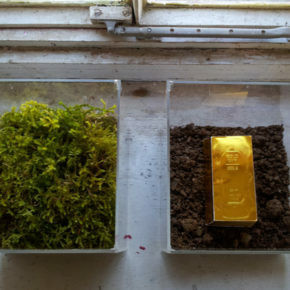 The word “Future” is developed in relation to the natural resources, the new forms of agriculture sustainability, and new philosophies of eco-living, as new perspective for a future integration between man and Nature. 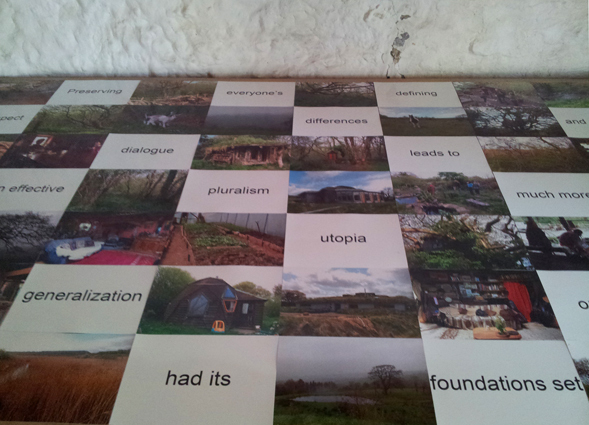 All the interviews collected during the three weeks residence in Wales, and realised during the visit to organic farmers and eco-villages, have been edited in a final sound track. 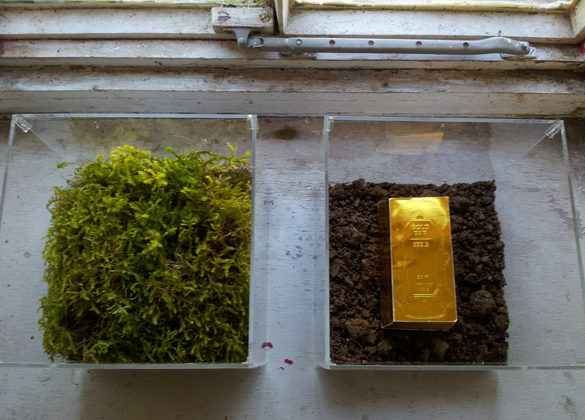 The word “Nature” is developed as primary elements for the survival of the human being, and is represented by natural elements collected from the land around the mill, especially the moss from the tree and place in a plexiglass box. 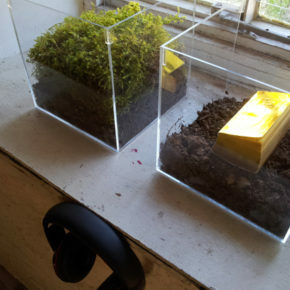 Moss represents one of the most ancient and primitive form of plants, Since it does not possess roots (those that have only play the role of anchor) can also live where is present a thin substrate, as long as there is sufficient moisture; even though it is well known that most of the species manages to overcome periods of drought remaining in a dehydrated state, which can be overcome in a few hours in the presence of water. 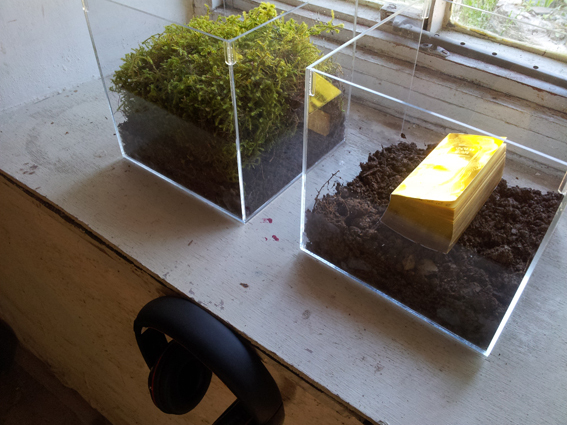 For this reason the moss become a symbol of regeneration, adaptation and at the same time a symbol of the wet landscape around the mill. 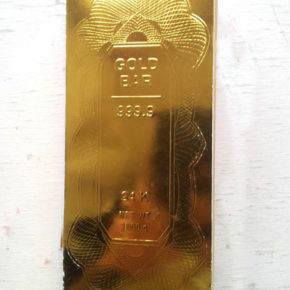 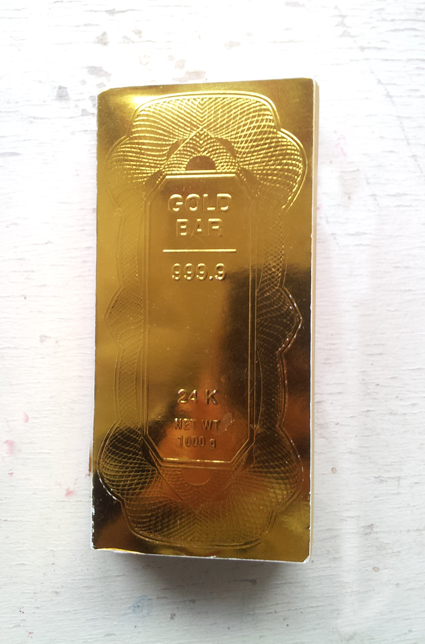 The word Culture is develop in relation to the Welsh local culture, using traditional tales, legend, poems, writing on a block of paper with the shape of a 999 gold bar. Preserving cultural biodiversity is one of the aim of the Manifesto, as collective heritage, memory and identity. 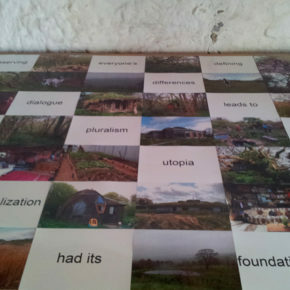 The final work is composed by a photo composition, documenting the interviews realised in Wales and a writing re-creating the thesis of the manifesto that has inspired the step. 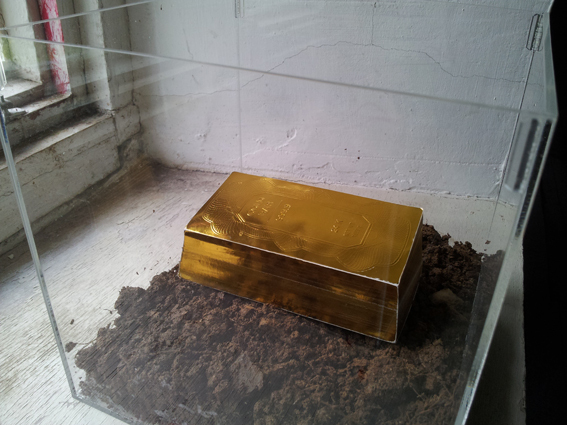 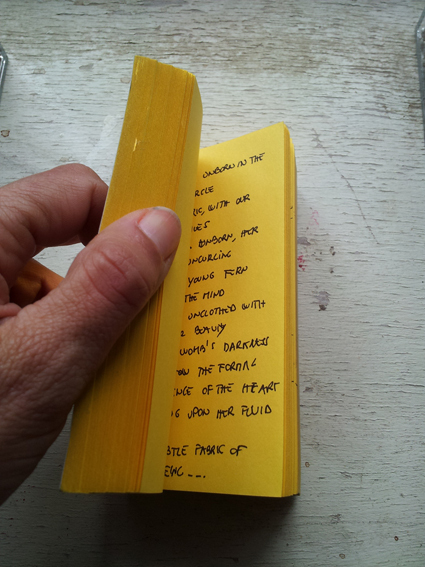 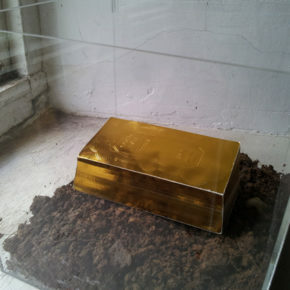 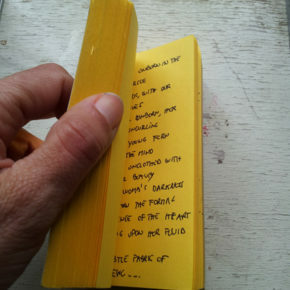 Near the photo composition are placed two boxes, one contains ground and a small paper block in a shape of a 1 kg gold lingot, containing traditional Welsh tales written on the sheets; and the second box contains the moss and the sound track of the interviews. 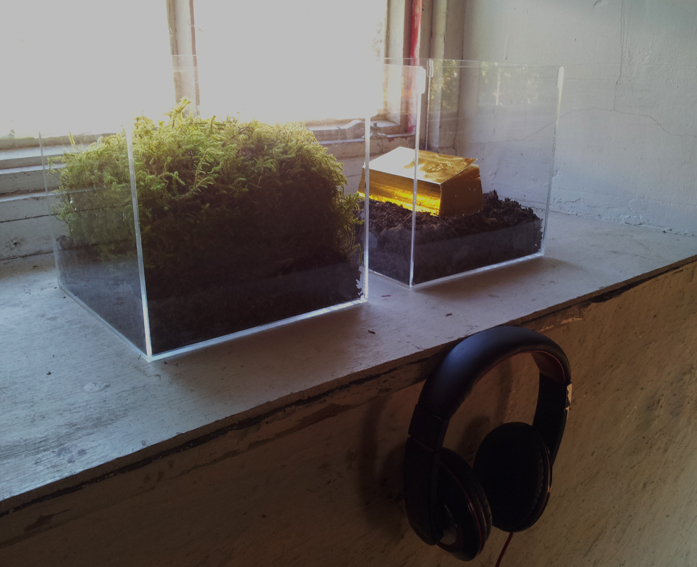 The sound track of the art work "1 Kg of investment in knowledge" was realized in collaboration with Jacob Whittaker.